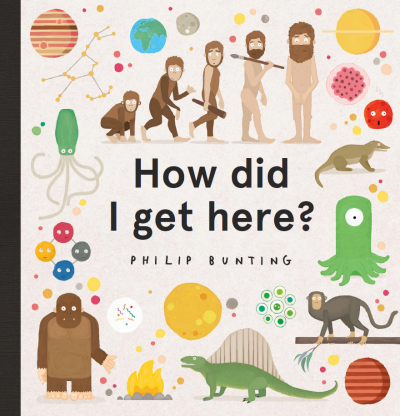 At some point the little kid in your life will venture to ask the question feared by most adults: ‘How did I get here?’ The history of life is a big concept to wrap young minds around, and Philip Bunting’s latest picture book is a good start. Bunting uses simple language to explain complicated ideas: ‘Once upon a time, our entire universe fit into a space smaller than an orange. In those days, there wasn’t much to see around here.’ From the Big Bang’s dust particles, to the creation of planets and suns, the very beginnings of life on earth are described, with the slow progression of aquatic life forms evolving to terrestrial creatures and then homo sapiens. Bunting paints a chronology of human history in broad strokes—migrating from our African origins, learning to farm and then build communities and cities—before narrowing in on the individual reader, addressing them at the end as ‘one of the newest additions to a family tree that goes all the way back to the very first life on Earth’. The illustrations are unfussy and employ a minimal colour scheme—the story is complex enough without messy pictures. Recommended for curious mid-primary scientists who want a simple explanation, How Did I Get Here? is an effective launching pad for more intricate investigation.